Hello! So here we are about to start the first full week of the new year. I start school tomorrow. I am looking forward to it. 11 weeks and I will be finished with everything but the internship. I can't believe it. My first module is Ayurveda which I am looking forward to. I know a bit about it, but have much to learn. If you like Indian food there will be lots of good recipes for me to share! If not, bear with me, the next module is raw/living foods. That should be interesting as well. So here is the recipe for the fajitas we had with the refried black beans. The hardest part of this recipe is all the cutting. Getting all your vegetables about the same size so they work nicely together as a filling is key. It is not critical but it makes the fajitas nicer. You cut peppers, carrots, onion, and zuchini into long thin stips, then basically stir fry them with some seasoning. Simple! You can use this as taco filling, as fajitas, in quesadillas, on salad, to fill a potato, in an omelet….really you can use if for lots of things. Four of us ate this so we only had a little leftover so I didn't get to try for anything but fajitas. We served it in flour or corn tortillas, with the refried beans and some salsa. You can add cheese or sour cream but it is really not necessary. Sliced avocado would be great. So did you make an intention for the year? or resolutions? I decided embrace a couple of rituals for the year. I read on Elizabeth Gilbert's (author of Eat, Pray, Love…you have to "like" her…she writes great stuff!) facebook page about her tradition of having a "Happiness Jar," Each day she writes down one thing that made her happy that day and adds it to her jar. She has done it for years and has this cool, huge jar filled with happiness. I loved the idea and decided to make one for myself. It is a small jar, for just this year…maybe I'll get a bigger jar or maybe I'll have a jar per year….I went to Hobby Lobby and bought some fun paper that I cut into squares that I will use for my happy moments. I already love how it looks and the idea of having a little jar of my own happiness! I also decided to write down my "word of the year" and what it means to me. I decorated the paper a bit, sealed it up, and added it to my jar. It is a little personal, but my word this year is grounded. I have a tendency these days to wish time away…hurry to get through each thing to get on to the next. Rush to finish school so I can get to my internship, get to my moms, get to NC, buy a house….rush, rush rush. Not good. I need to really just be grounded, enjoy each day, be present in the moment. To be grounded in the reality of the day. And when the time is right later this year, I will work on setting down some roots, being grounded in a new town, new house, new job. Grounded. That's my word! Also, I did a little quiz online that then sent me a mantra for the year. It gave me I am here. Perfect. So a nice but nerdy new year's eve, some wine, some fun paper, some introspection. I also wrote on little slips of paper all the things I wanted to let go of from 2014. Things I didn't want to carry into the new year with me. On New Year's Day morning, I burned them all. 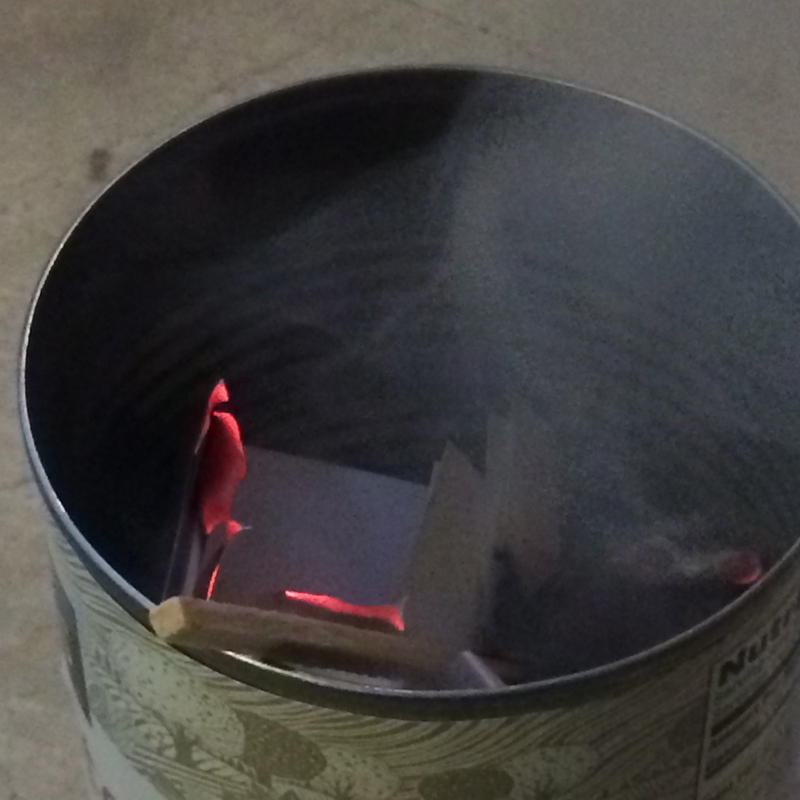 I don't have a fireplace or a fire pit, but a little can worked just fine. So here's to a great start to 2015. A few made up rituals, and a good recipe for you! Start by prepping all vegetables. Cut them all into long thin strips. To cut the peppers, cut off each end, then cut through it to make one long piece. Clean out the seeds and cut out the white ribs. Cut this piece and the ends into thin strips. Cut off the ends of the carrots. (No need to peel them.) Cut into 2 -3 inch long pieces. Cut each piece into 1/4 inch thin planks longways (not circles). Cut each plank into thin sticks. Cut the ends off the zuchini. Follow the same instructions for the carrots. Cut the onion in half through the stem and root ends. Cut off the ends and remove the outer skin. Cut into thin strips, cutting from stem to root end, not the other direction. Heat the oil in a large skillet over medium high heat. Add onions and cook about 4 minutes, until tender but not yet brown. Add the carrots and cook stirring often until getting tender about 3 minutes. Add the peppers and cook another 3 minutes. Add the zuchini and seasonings. Cook stirring often until all vegetables are cooked and starting to brown nicely. Remove from heat and stir in cilantro. Serve in tortillas with beans, salsa, avocado, and if you like cheese and sour cream, although I don't think they are necessary.